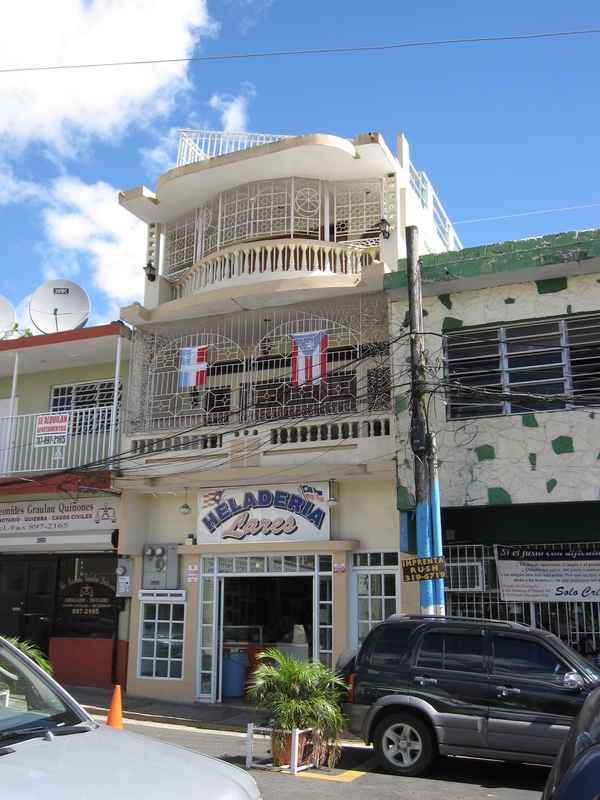 Yuki and I were cruisin’ around this weekend and ended up passing through the Puerto Rican strip of Division Street. Right about that time both of our stomach’s started to growl. Her’s may have been the baby kicking, but mine was definitely something else. 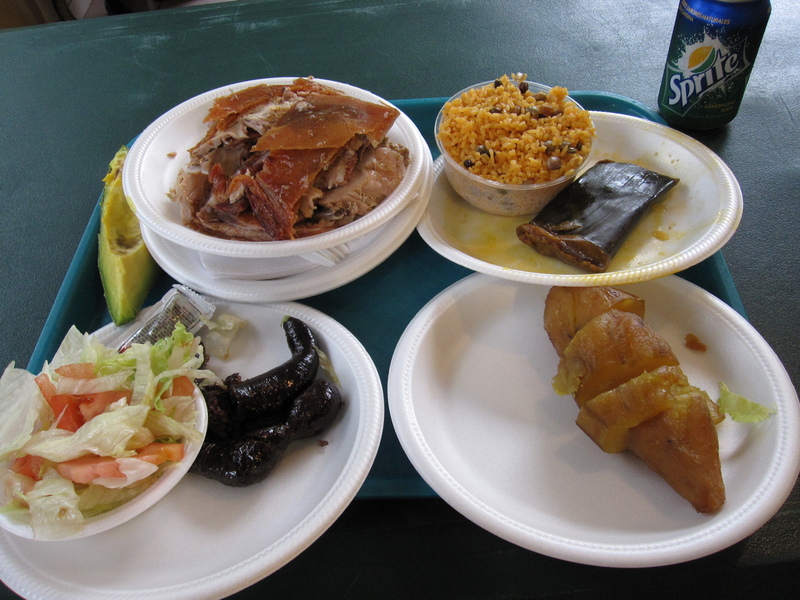 While neither of us were all too impressed with the food we ate in Puerto Rico, with the exception of a few spots, we never really explored the Puerto Rican food in Chicago. Funny thing is we used to live 2 blocks east of it and frequently rode our bikes past it on our way to Humboldt Park, yet never made it down there for eats. When we saw Papa’s we had to stop in and give it a whirl. Honestly though, we thought it was Papa’s as in potato, but it was all about the bald guy in the pic below. Oh well, it was very busy, mostly with Puerto Rican/Chicagoans, so that was a good sign. They do have papas fritas on the menu though. 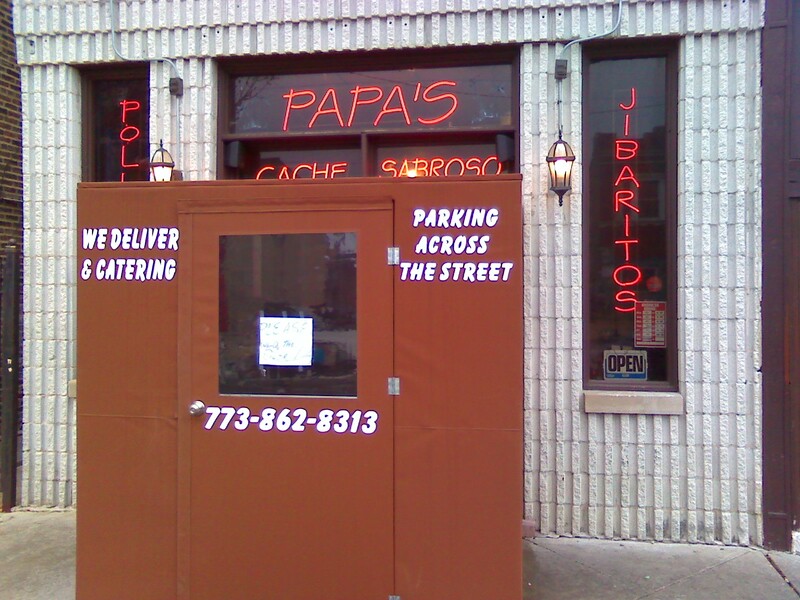 Papa’s is a small little place run by Papa and Mama. I love the palapa over the counter, gives it a nice tropical feel. 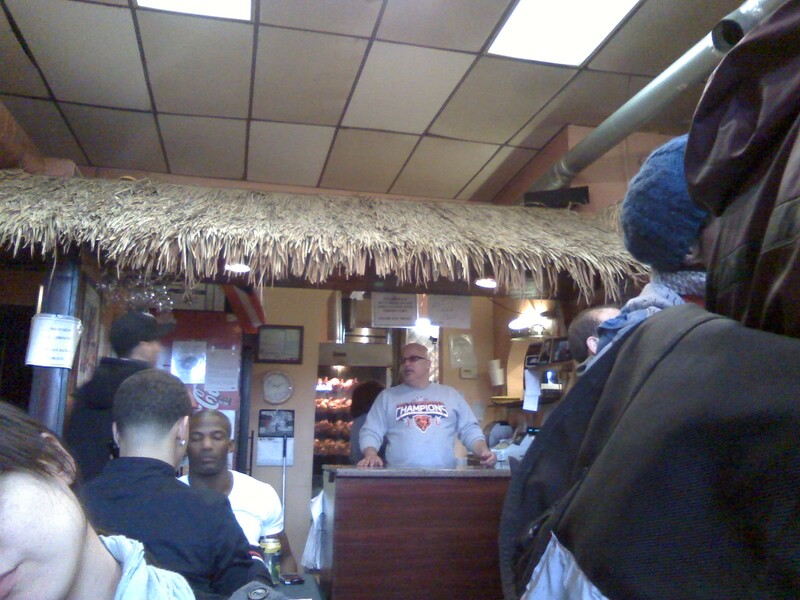 The menu is mostly based on rotisserie chicken, as you can see the numerous birds rotating behind Papa. Not having had a Jibarito in a long time, and with them claiming to have the best in town, that seemed like the way for us to go. So, we grabbed a seat as soon as one opened up, and Mama came by to serve us. Yuki got the rotisserie chicken breast and I got the steak. The plantain was the perfect thickness and fried just right. Fresh lettuce and tomatoes, garlic mayo, and some sort of white cheese rounded out the garnish. Hers came with Spanish rice and pigeon peas while mine came with white rice and beans. 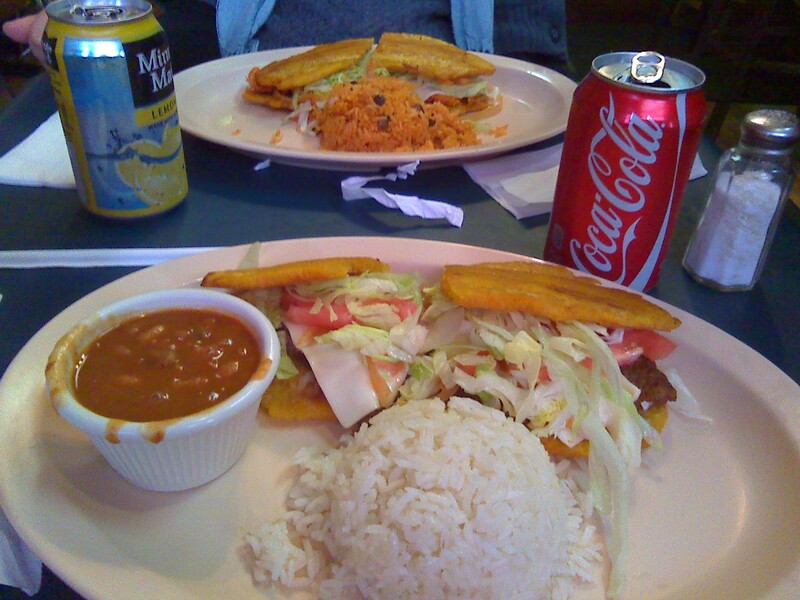 I have to say, they may be right, it could very well be the best damn Jibarito in town! Granted, I’ve only had three in my life, but these were by far the best I’ve had. As good as the steak was the chicken was outstanding! They may also have the best rotisserie chicken in town! Juicy and flavorful! When Mama brought the bill there was this bumper sticker with it. I won’t put it on the green machine anytime soon, but they certainly do have every reason to be proud of the chicken. We will definitely go back for more sometime, only next time we’ll probably get a whole bird and rip that thing to pieces in a matter of seconds! 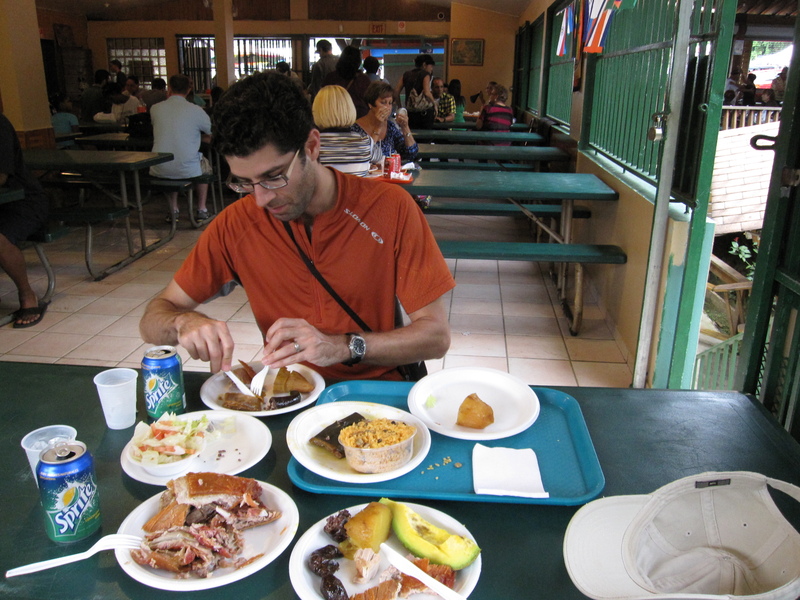 The food in San Juan, Puerto Rico is very expensive for what you get. I guess that’s expected in such a touristy city. That’s especially true when walking the streets of Old San Juan. While that part of town isn’t without its charm, rustic old world food certainly isn’t its draw. 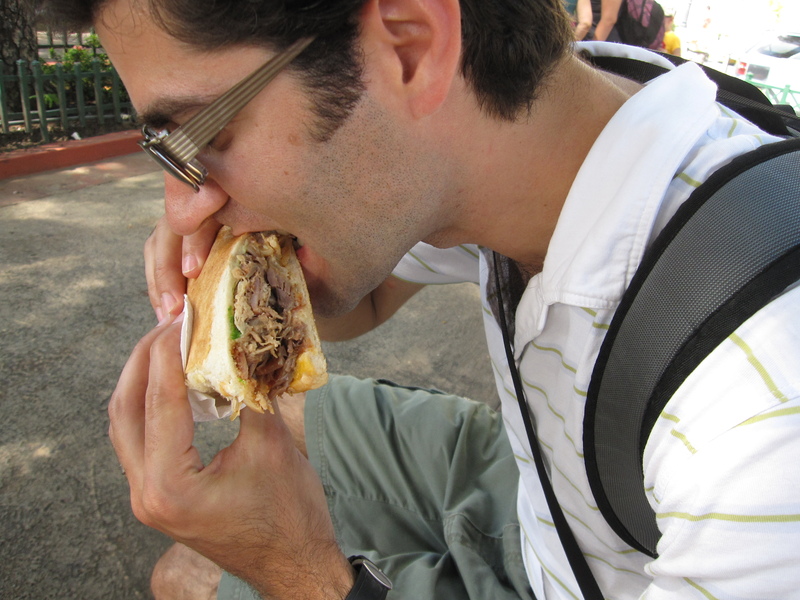 We found that the best way to fill your belly without emptying your wallet is to find a good kiosk and get your hands on a tripleta sandwich, a similar morsel to the Cuban sandwich. 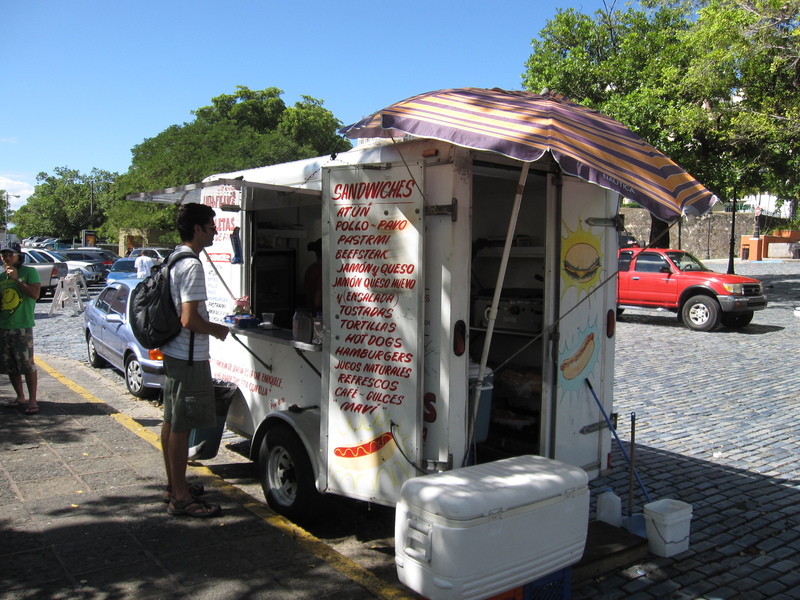 We found this Las Tripletas kiosk on the south end of Old San Juan on the cobblestone street near the cruise docks. 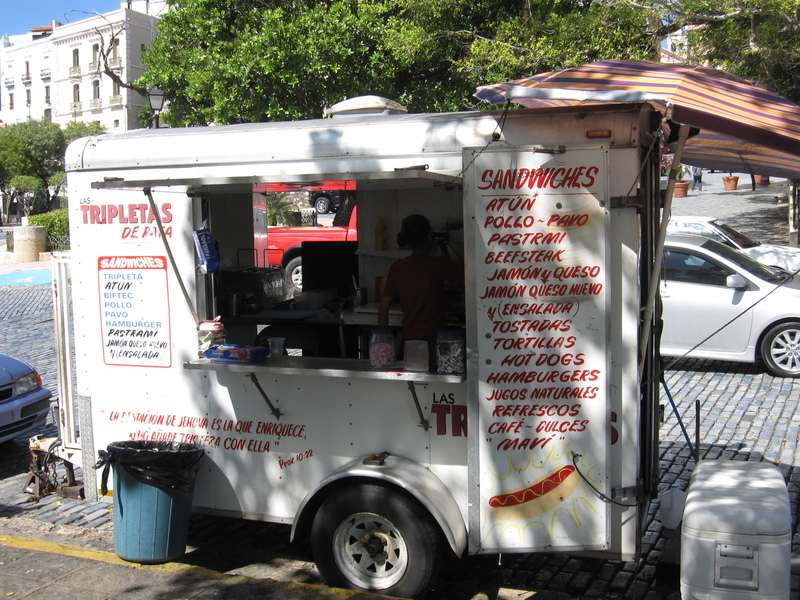 While I was ordering the sandwich artist told me that his tripleta was much better than any Cuban I’d ever eat. 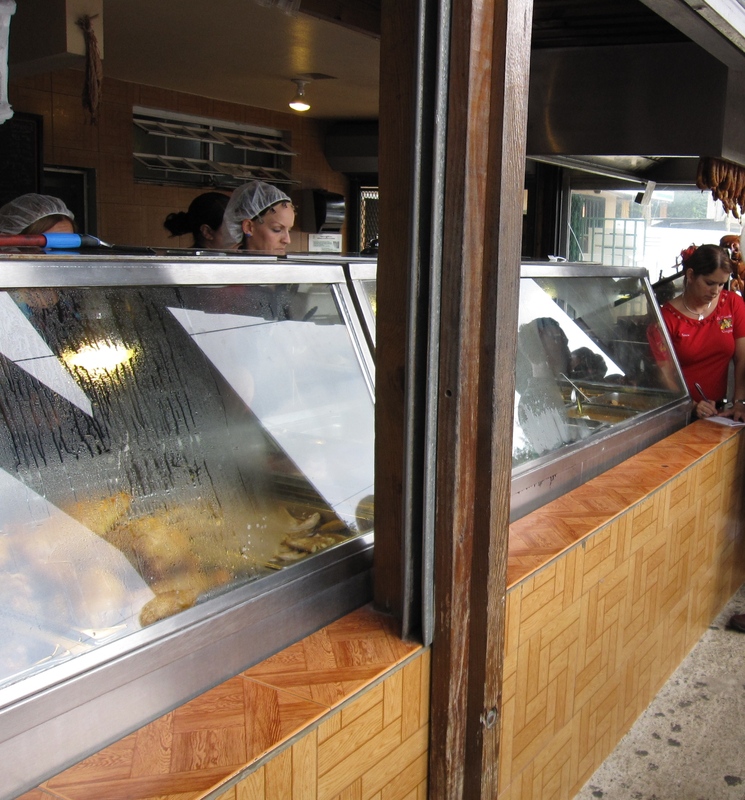 When I asked why he said because his pork was wet and juicy while most Cubans had dry pork. Nothing better than a wet sloppy pork sandwich. Well, almost nothing, I can think of a few things but that’s another conversation. Quite spacious for a little kiosk. 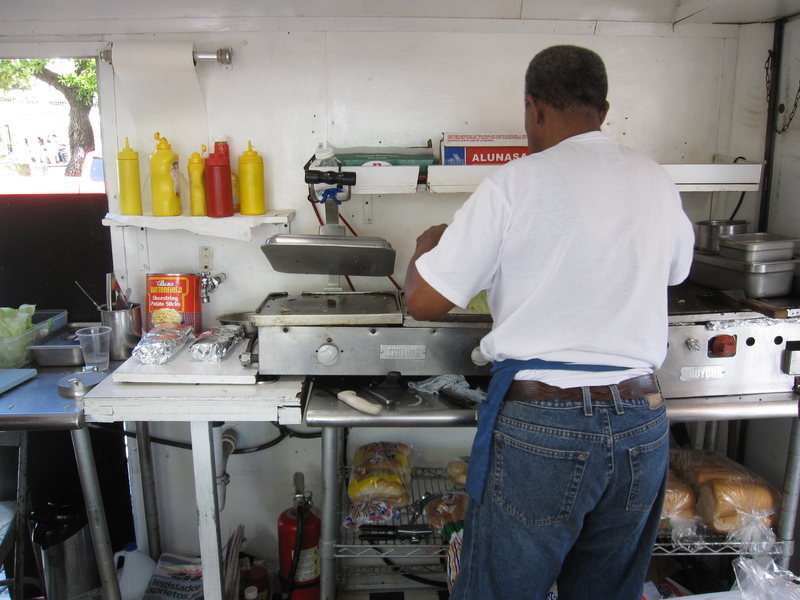 My man here layered the lettuce, tomato, turkey, ham, and pork on the pan de agua (typical Puerto Rican baguette), then squirted some mayo all over and pressed it on his griddle panini-style. It was a damn good, juicy pork sandwich. Not bad for $5.50. Lares is a crusty little mountain town in Puerto Rico. It’s famous for two things. First, in 1868 it was the birthplace of the uprising against Spanish rule, El Grito de Lares. 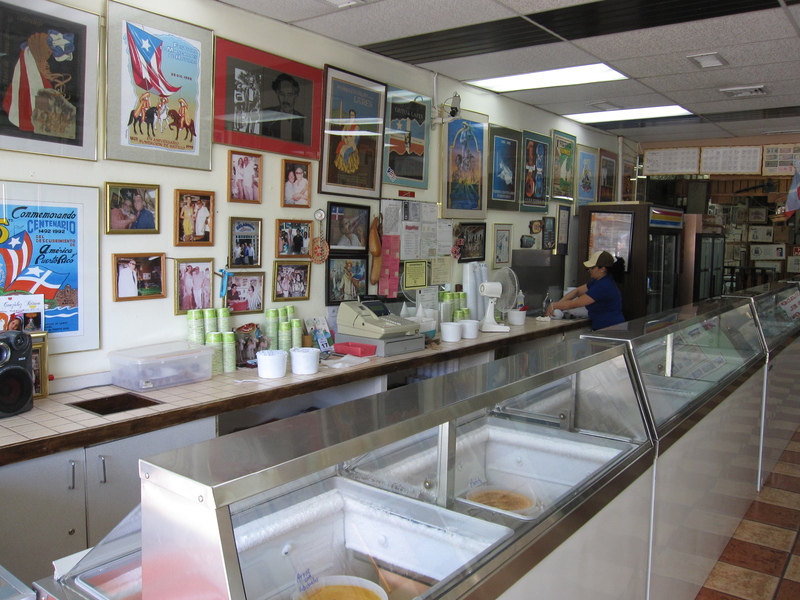 Second, and even more historically important, in 1968 Salvador Barreto opened Heladeria Lares. This is no ordinary ice cream parlor, no sir. This ice cream parlor not only makes regular old chocolate, vanilla, strawberry, etc. ice cream. 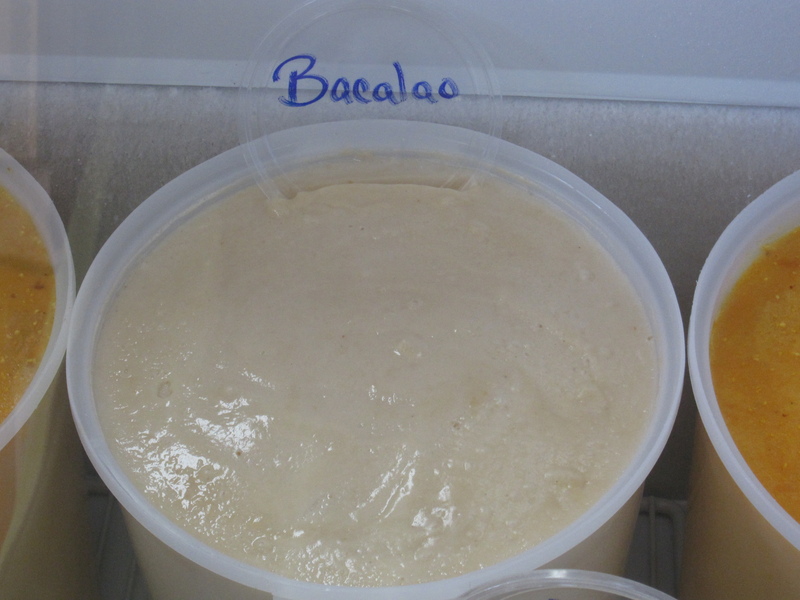 This ice cream parlor will make ice cream out of anything! When you walk in there are literally at least 50 different flavors to choose from. The do limit you to 3 samples though. Kind of a shame because there are so many I wanted to try, but they need to be able to sell some ice cream so I understand they don’t want customers to fill up on free samples. I sampled the Arroz con Gandules. Rice and pigeon peas, it was actually really good. 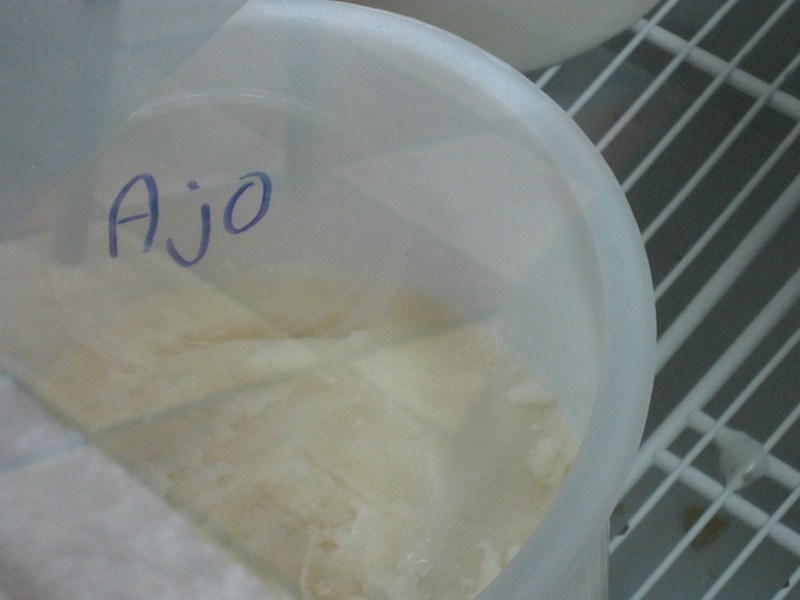 Ajo, or garlic. They did a great job of accentuating the sweetness while suppressing the sharpness of the beloved garlic clove. Bacalao, salt codfish. This one was absolutely disgusting! Salted fish should never ever be turned into a sweet treat. It was one of the worst flavors I’ve ever had in my mouth. 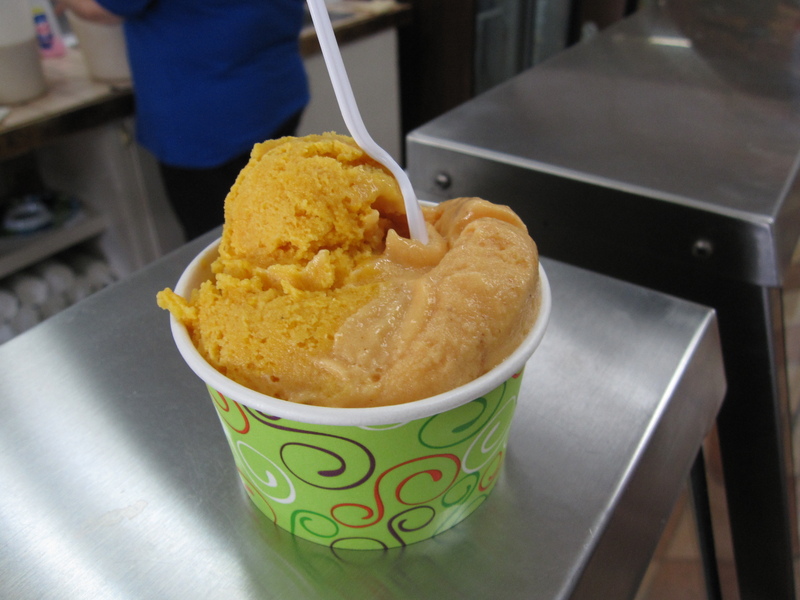 I ended up getting a scoop of two flavors I didn’t try but was confident would work together, ginger and pumpkin. I was right, as usual. They gave me a little bit bigger scoop of ginger while I would have preferred more pumpkin, but hey, you can’t have your ice cream and eat it too. 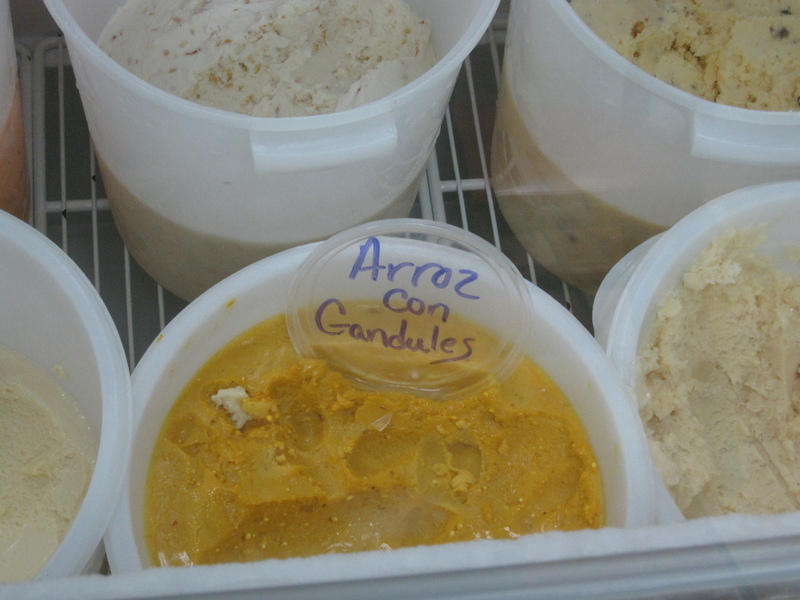 Yuki got a scoop of the Arroz con Gandules and one of the sweet potato. Both excellent scoops of ice cream. 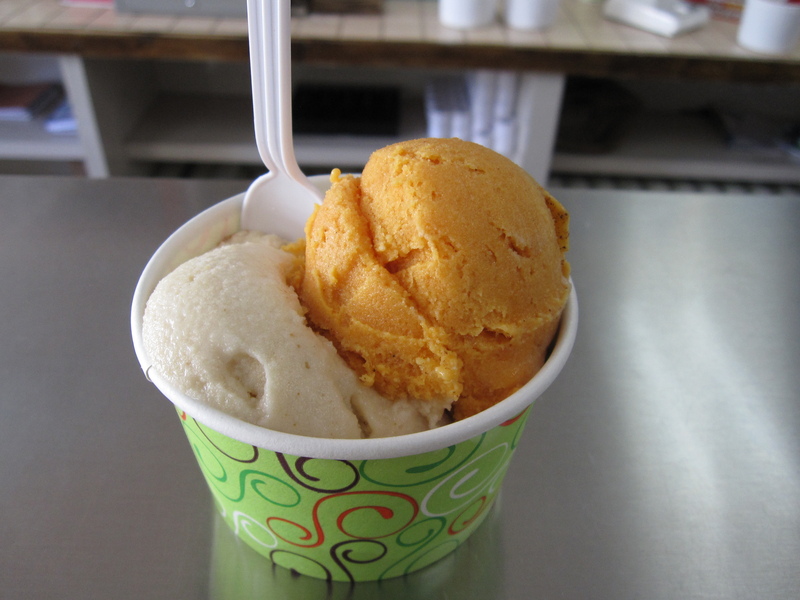 If you ever get to Lares, you have to hit Heladeria Lares up for a sweet adventure. Some of the flavors are just as terrifying to even think about as they are to eat, but mostly what they do works out just fine. With people like Bill Clinton haven eaten their ice cream, I wonder if they’ll come up with a special cigar flavor. There are few things more satisfying in life than sinking your teeth into something truly special. 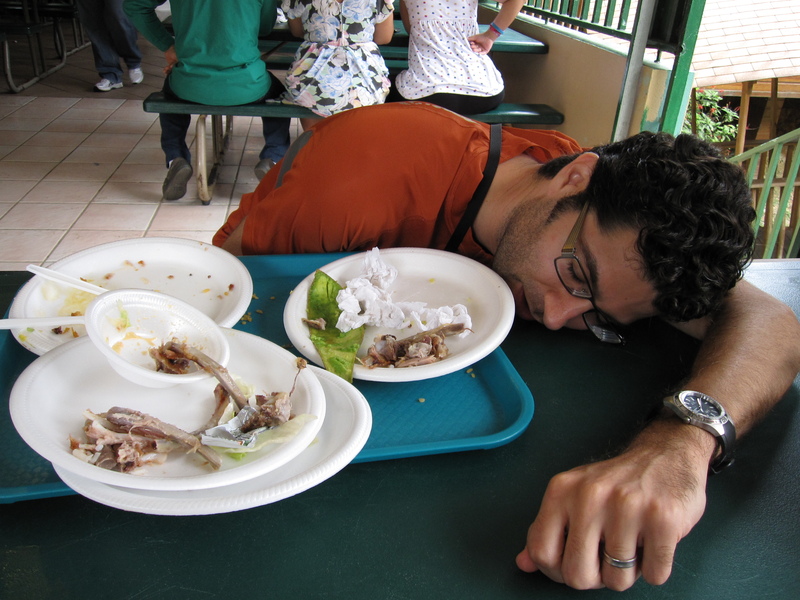 Living in a fast food nation this is something that is harder and harder to come by. Yuki and I were just in Puerto Rico for 10 days, and due to American influence it’s also hard to come by there. If you look though, you can still find moment of culture, that moment of awe, that moment of pure bliss. 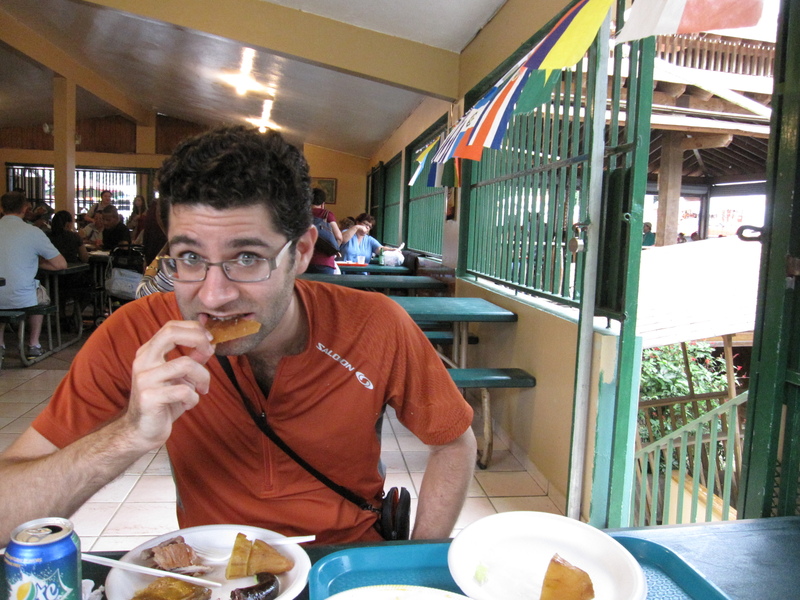 For us, that moment was found in Guavate, better known as “The Pork Highway”. Nestled in the mountains about 45 minutes south of San Juan, Guavate has become a destination unlike any other. I was first alerted to it by Andrew Zimmern’s Bizarre Foods Episode in Puerto Rico. As a fellow Jew who appreciates the fine art of lechon, suckling pig slowly and expertly roasted on an open fire, I knew I had to get me some. After turning off Hwy 52 on Rt 184, we kept winding around the mountains looking for this juicy animal. We’d go by a lechonaria here, a lechonaria there, but nothing that resembled what could be called “The Pork Highway”. And then, about 15 minutes later…Xanadu! We had found the object of our desire. A strip with 7 or 8 lechonarias in full bloom. We had told ourselves that we weren’t going to just end up at the one Andrew featured, we would head to the one with the most action, the one that locals were eating at. 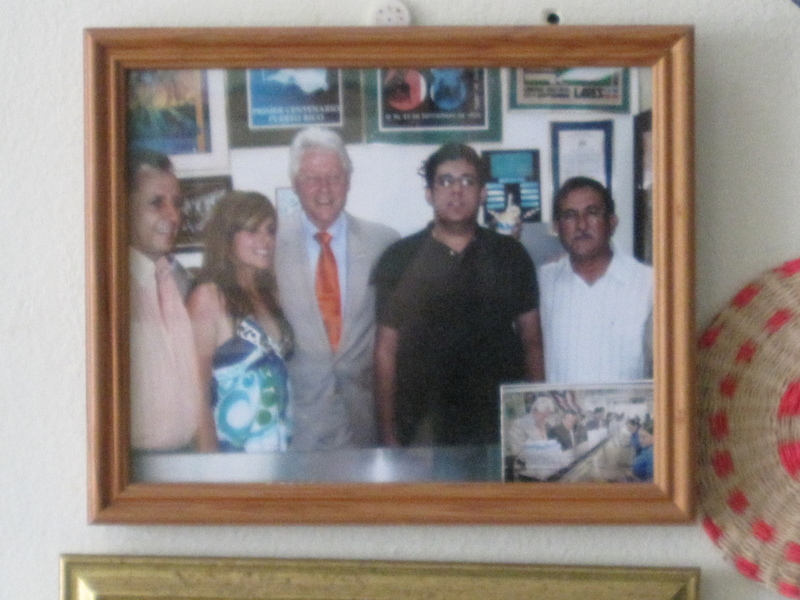 Of course, that ended up being the one Andrew was at, El Rancho Original. More aptly put, hog heaven! We got in line as our taste buds were salivating. The line was pretty long, but it moved quickly. 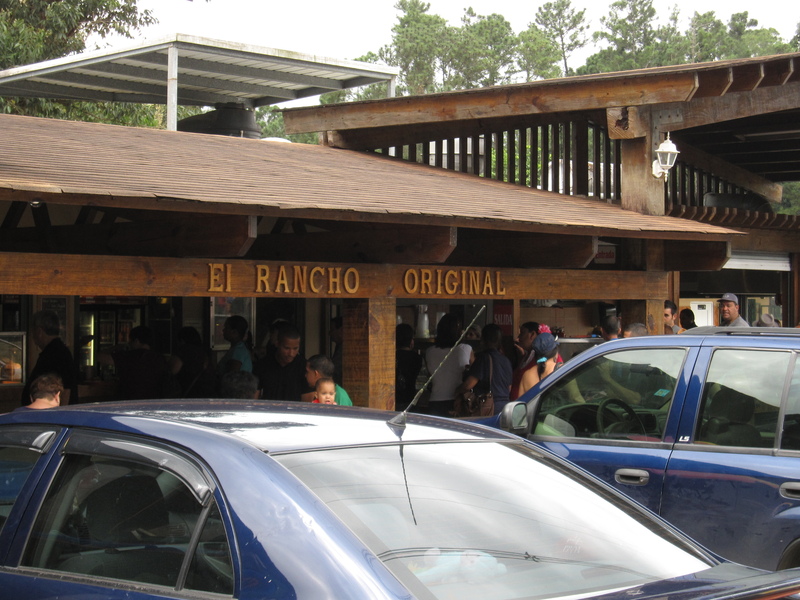 El Rancho Original is cafeteria-style, so you just order what you want then pick it up at the register. All the while they have live music and a dance floor that is always packed with people, especially old people gettin down. 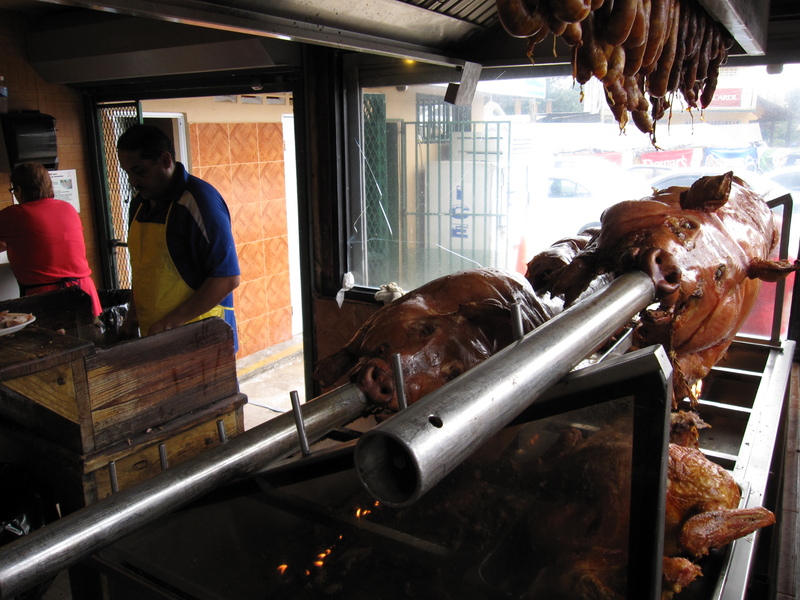 When we got up to order I just had to marvel at that pig on a spit with the master hacking it up with a machete. We speak very little Spanish, so they had to get a lady over who spoke more English to take our order. It all worked out as we got what we wanted. We grabbed our food, walked past the dancing into the back cafeteria, and proceeded accordingly. We ordered a plate full of lechon (of course), some rice and beans, this tamale-like thing of mashed pineapple and pork, a salad of lettuce and tomato to help our bowels process this overload of nutrient information, some morcilla (blood sausage, basically pigs blood with rice and spices stuffed into its intestines and grilled), sweet potato, and a big slice of avocado. It may not look like much in the photo, but believe me, it was a lot of food for two people. All for only $21! I dare you to find a deal like that in Chicago. Mmmmmmm, crispy skin. Or, as Yuki likes to call it “meat candy”. This spread was so good! It really was the best pig I’ve ever eaten. My older brother is going to be mad at me for saying this, but Jews are CRAZY!!! Along with every other culture and being who deprives themselves of such pleasure. Call me a hedonist, but that pig sure is tasty! If I could eat El Rancho Original’s lechon every day three times a day I would, as long as there was some beef and scallops peppered in there. Pork coma. You know, a good nap is a necessary part of life. 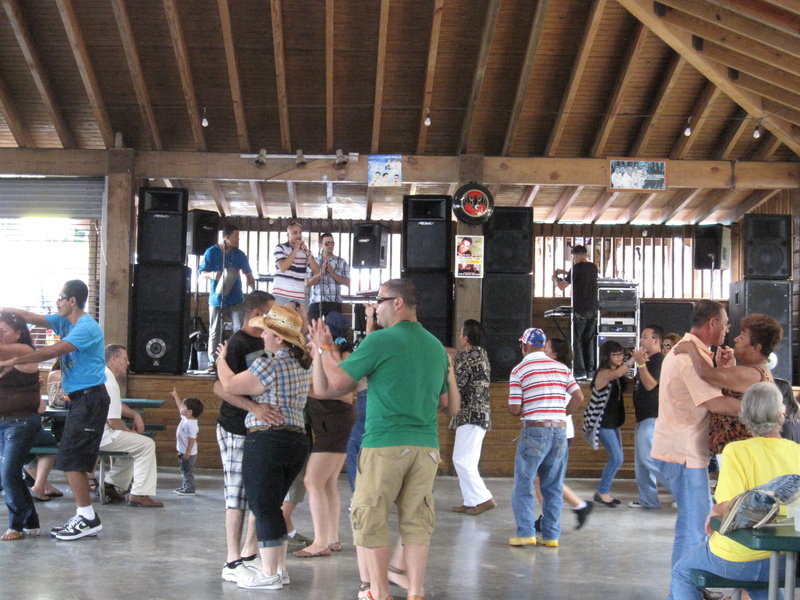 Once the pork coma wears off you really have no choice but to start shaking your hips and moving various body parts to the rhythms of old world latin music. Or, maybe all of our bodies were just convulsing from pork overdoses. All I know is that Guavate is one of the last true Puerto Rican experiences left in this world. Something not to be missed if you’re ever in our 51st state, or commonwealth, or whatever it is.